I don’t pick up as many craft books as I used to, but recently these two have joined my craft book library, and I’ve been quite enjoying both of them. You’d expect me to talk about a quilting book first, right? Wrong! 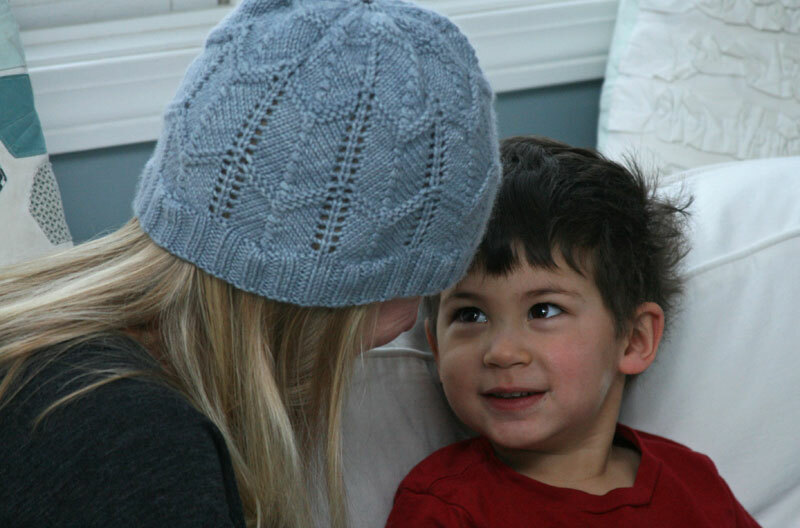 Winter typically finds me wanting to knit something, and this year was no exception. As soon as I saw Jane Richmond and Shannon Cook’s newest book, Journey , I knew I had to buy a copy. 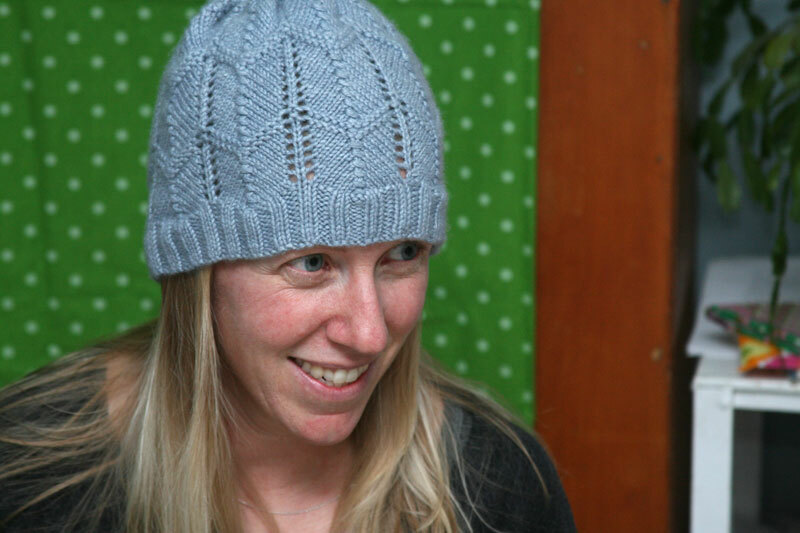 Interestingly enough, while I love most all of the knitting projects included in the book, I knew even before buying it that it was likely that I was only going to knit one project from the book – the Swift hat. 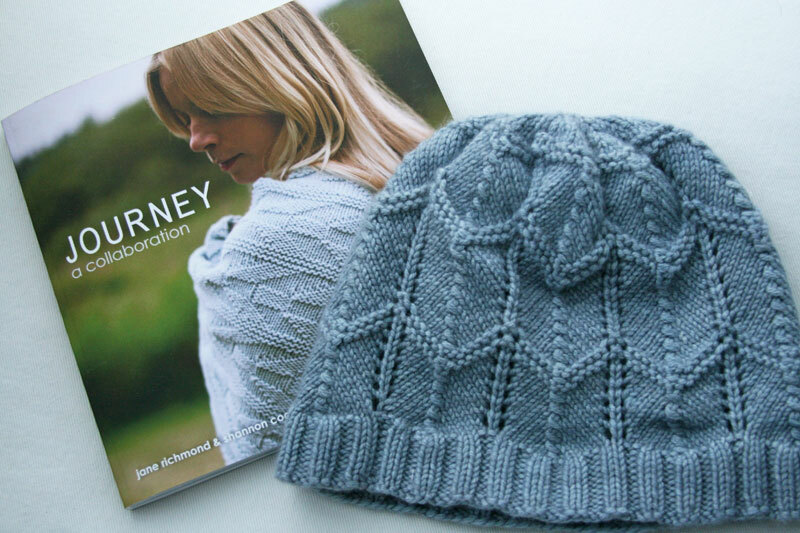 I write that only to say that even though the patterns can be purchased individually, I love having the book – for the beautiful photographs, and for making me feel like someday I may actually have the skills to knit myself a sweater (and if that day ever comes, I’ll be ready!). I quickly ordered myself some circular needles and got to work on the Swift hat. I had some gorgeous Plucky yarn I had managed to snag years back, and even though that probably wasn’t the recommended yarn (I’m never one for following directions! ), I knew I had to try to make it work. I think the hat was meant to be slouchier, but my yarn didn’t lend to a slouchy look, so I only did three repeats of the pattern rather than four, and I must say it worked out quite well! I’m already planning a second hat. (I’m a little spoiled by that Plucky cashmere though, so perhaps I have to try to snag myself a bit more of that first!). I think I may even attempt those Spate fingerless mitts, and maybe someday I’ll be up to making an Antrorse sweater (Check out Shannon’s on her blog today)! Until then, I’ll just be admiring the beautiful photos in this lovely book. 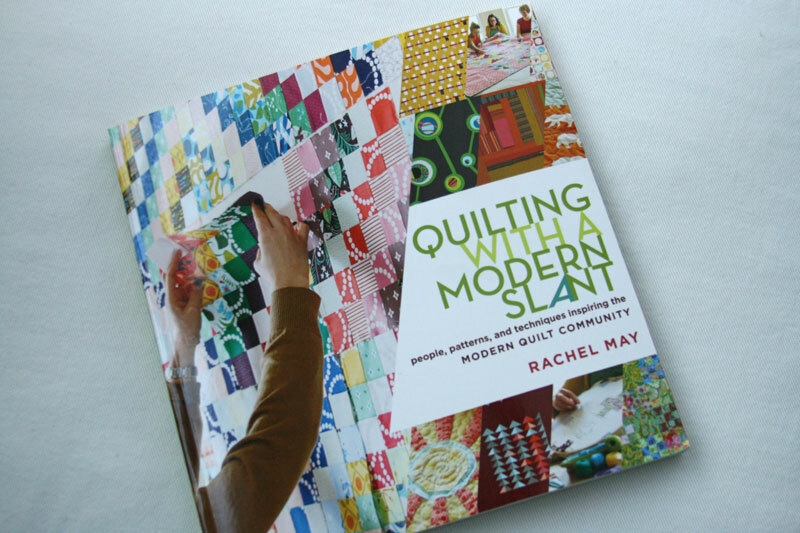 This new book, Quilting with a Modern Slant: People, Patterns, and Techniques Inspiring the Modern Quilt Community , by Rachel May arrived a couple weeks ago, and wow! 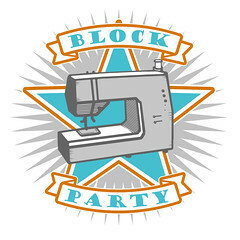 Rachel did such a wonderful job putting together a beautiful book jam packed with wonderful examples of modern quilts, interesting interviews with more than 70 artists, tips and techniques, and patterns. I’ve been having a great time reading a page or two every time I have a chance (usually while feeding Hazel!). I only allow myself a couple pages at a time, because it’s the kind of book I’ll be sad to finish. I had about 4 seconds to take these photos yesterday, but honestly, it doesn’t matter what page you flip to – they’re all pretty great, and I’m quite certain I’ll read/see/learn something interesting on each page. 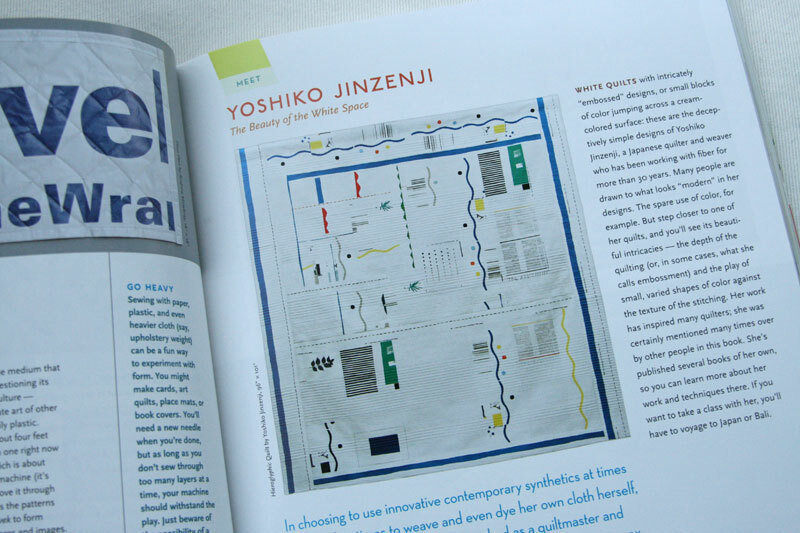 Like this page about Yoshiko Jinzenji. 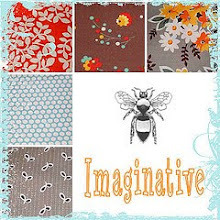 I’ve loved her work for a long time, and in fact, have been hoarding a stack of her early fabrics. 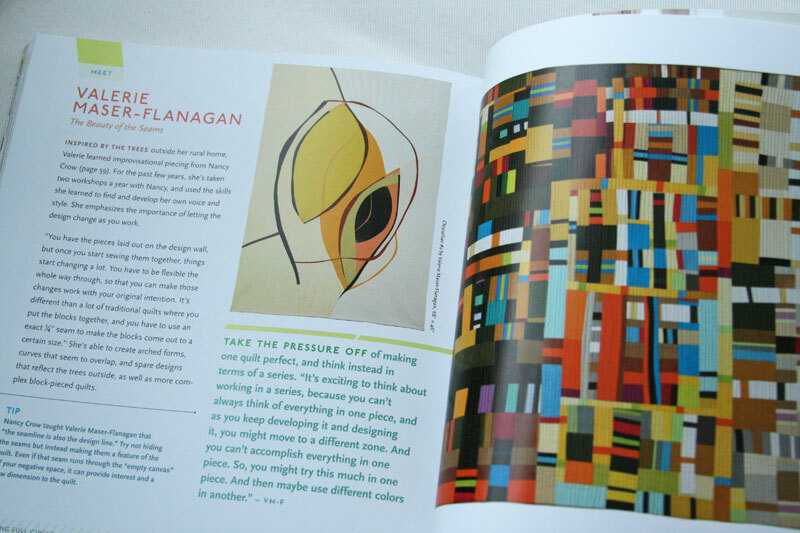 Or this page, about a new-to-me artist, Valerie Maser-Flanagan. I’m drawn to her City Walk #2 quilt and loved reading what she wrote about having to be flexible as you’re working. This is something I think about often – there are a few improv quilts I’ve made that have ended up being quite true to my original idea or sketch, but many others that have completely evolved as I’ve worked. I was so honored that Rachel included me in this book. I had a great time chatting with her (despite being nervous about it! ), and since she’s not too far away in Boston, I hope someday to meet her in person. I kind of wish this quote wasn’t the one pulled out and highlighted, because out of context I feel like it makes me sound a bit like I just don’t care, which is certainly not the case! If I recall, we talked a bit about blogging – at the time, back in 2012, blogging hadn’t really fallen off as much as it seems to have lately and she was asking about the pressures of writing when you know you have an audience. What I was trying to say, not so very eloquently, was that I try not to let that pressure what I create. I think you can go crazy trying to predict what readers want to see and what you should make. I’ve always done best just making those things that excite me and make me happy, and I always hope that my love for what I’m making shows through and makes someone else excited to create something. It’s really a wonderful book, and I highly recommend it! This entry was posted in Knitting and tagged jane richmond, journey, knit hat, knitting, modern quilting, quilting book, quilting with a modern slant, rachel may, shannon cook, storey publishing, swift hat. Bookmark the permalink. 13 Responses to two new books! I spent like two hours just loving this book the other night! In fact I think I’m going to go back and re-read everything! So inspiring! Well, there are people who say there are no coincidences – and I am willing to agree. Right now I am stitching up the “Converging blocks” and here you are published in this great book ! Compliments from Germany. No! It does not sound like you don’t care. It sounds like you love what you do and keep focused on it. It sounds like you do care but you know you have to do your stuff your way. my copy of the quilt book arrived a few weeks ago but i hadn’t had a chance to read until this week – mid-winter break for schools/work. it was fun to read about so many of the quilters i follow – you included! i still occasionally look back at all your quilts – amazed at how much you have accomplished and inspired in such a short time! and i do think it’s much more fun and creative to design and quilt what you love. it shows in the works! I think I’ve said this before – you are real, you do what you love in ways that inspire me, and you share it here. For that we all thank you. Ashley! The hat looks amazing. I’m so jealous that you can knit. And Max is so precious. 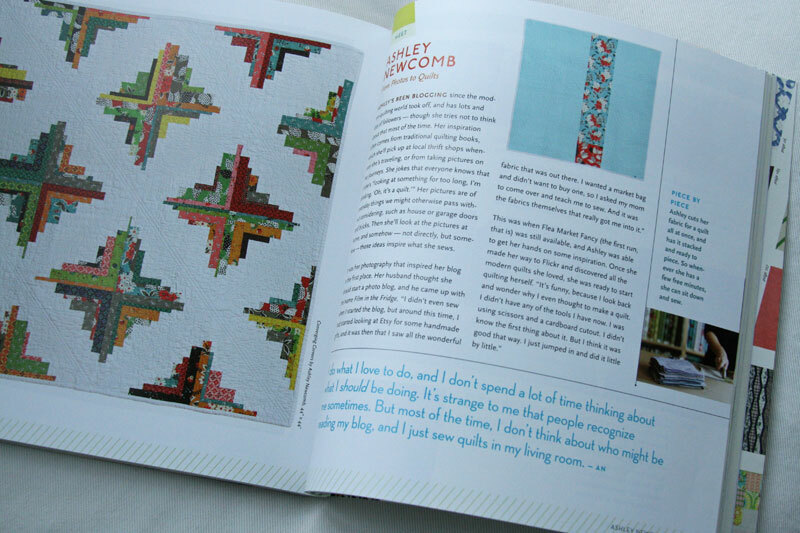 Congrats on being featured in the quilting book! I completely understand what you meant, and I really appreciate it. It makes my skin crawl to see so many bloggers changing who they are and what they do simply to cater to whoever writes them a bigger check. And then I stop reading those blogs, because they are nothing more than a big advertisement. Your blog is nothing like that. We come to you because you are totally original. You love what you do and you do whatever feels right. I love that. Keep it up! Awww, yay! It turned out great regardless! that color looks so nice on you! And the yarn shows the stitch definition just great! I love plucky knitter yarn! Thank you so much for your support and the kind words! I’m just thrilled that you enjoyed the book! Love the hat! I am a through and through quilter, but love winter for knitting a hat or two. They are so quick and nice for something a little different than fabric. AND, I can watch TV while I create! Darn it. I’m really trying to curtail my craft book buying but both these look too hard to resist. . . I like the idea that you create for yourself and not an audience. I think it can steal the joy of the craft if you do. Congrats on the book. Your blog keeps me thoroughly entertained and inspired while I’m feeding my seven month old daughter. Where would mothers of babies be without craft project planning keep them entertained during the hours spent breastfeeding every day and night! Thank you for all the work you put into your blog, I don’t know how you find the energy but I’m so grateful for it. I bought the book on knitting while in a beautiful wool shop last month. My daughter wants the socks : ) I am hoping to get that quilting book. I’m happy you are in there. I’ve made your converging corners quilt and really enjoyed it. The hat turned out great! Very impressive!